I made another one of what I thought was ghost quilting - see my last post here to find out about ghost quilting and the links to those who started me on this path. So I took my pastel sticks and colored in some of the drawn in parts. Then took a blender stick that I bought for colored pencils and rubbed in. See the leaf that looks sort of crayonish - the blender ............ well blends the color. I then applied textile medium which is really just a matte white glue that dries clear because those pastel sticks rub off. As it was I ended up getting some on the white background just alittle bit. So here it is finished - ended up being pretty seamless - hard to tell where the 6" decorator fabric ends almost. Good or bad thing? not sure but all I know is this is really fun to do and I like it. I think I will call this technique off the edge quilting. What do you think of that name? any other suggestions for naming this technique? Since this is my spring - a grey frozen lake. I decided to make a spring landscape. I NEED TO SEE GREEN! Actually most of the ones in this photo were to dark. I want light springy greens. First a simple mountain / rolling hills landscape was sketched out full size. Then from the back (reversed) side I traced onto freezer paper and cut out. You can see some hills 8,9 and 10 laying on the sky. Ironed on the back side of batiks and turned under on the top edges. I choose a preprinted sky which I normally don't use but the color was right. Now I need to add "stuff"
I'm thinking a barn and whales tails. There is a place near me here in land locked Vermont that there are two whales tails (sculpture) in a field. It's the coolest thing. Stay tuned for how this ends up. 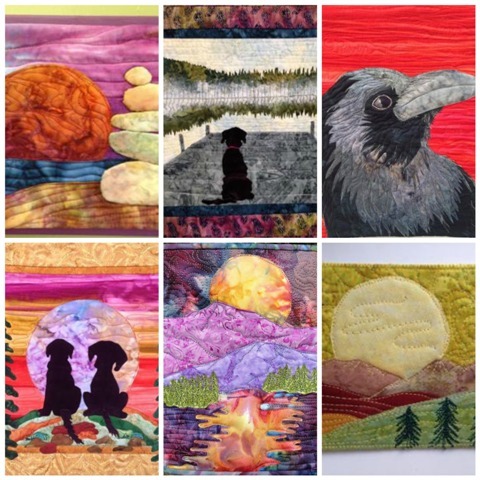 Last week I saw this blog post from Linda's landscapes about ghost quilting and loved the idea. She saw the idea in a AQS magazine that was written by Martha Ginn. The reason I am titling this post zombie ghost quilting is because I didn't do it the way the others did. I got carried away using my inktense pencils and there is no ghost but a colored in version. The next one I will try to refrain from playing with pencils and make it more ghosty but here is what I did. First I cut a 6" square from a vintage decorator fabric that I had in my stash. Fused it to a white background and penciled in where the square was cut off and then some. 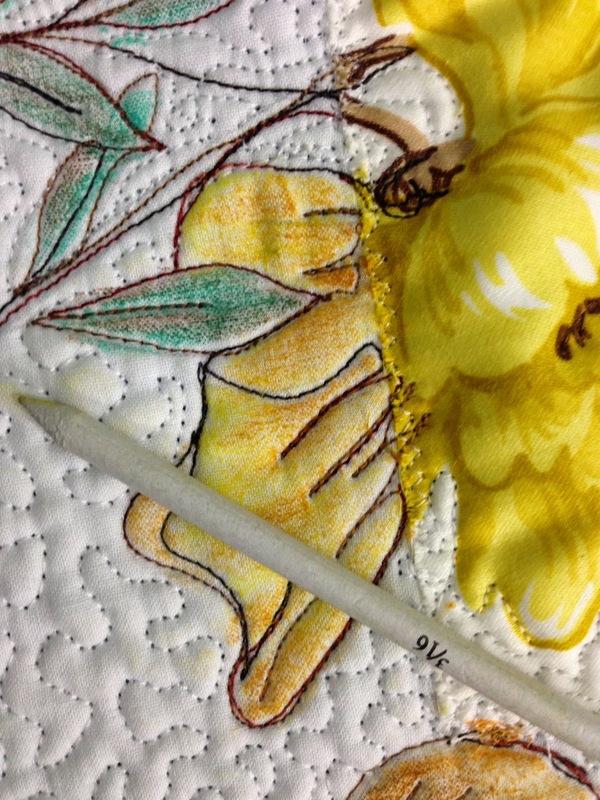 I then free motion quilted over the pencil using a brown thread. After doing an overall meandering with white thread I probablly should have stopped right there, maybe adding a hint of color here or there but I had the urge to play so colored with my inktense pencils. And this is wet. I used aloe gel to wet it for more control, trying to "color in the lines"
Amazing how the pencils come to life. Now I used a bright green felt for a batting so that's what you see coming thru when it's wet. But as you can see it goes away when it dries. Here is the finished and bound piece - I'm liking it. Now the way I did this I suppose some would say, well why don't you just cut a bigger piece of the fabric, quilt and bind that and be done with it but where would the fun be in that? Plus I like this so much better - more interest - don't you think? What would you call this - non - ghost quilting ? I am linking up to Nina's Off the Wall and the Rainbow challenge who's color is yellow this month. Oh, BTW - go to the quiltshow.com starting today thru the week end they are letting anyone watch the videos for free and there are some really good ones. You just have to create an account to log in hut it's completely free! I saw a story on our local news about sweet pea and fell in love with her. I knew I had to honor her by making her into a quilted fabric art piece. Last week I showed you how I started her - go here if you missed it. So after she was fused together I can pick her up and audition the proper background. Sweet Pea loves a nice sunny day so that's what I went with. Here she is before quilting and without her makeup on. She has her own Facebook page with over 2000 followers and is becoming quite the diva. Kim Kardashian is starting to get worried about this new social media all star from Vermont. Her first birthday is tommorrow, Saturday - March 14th. Farmer John and his lovely wife Jennifer are giving her and the knitting club a big bash and posting a lot of pictures on Facebook. I started a rather complicated fusible appliqué project today and wanted to share the way I usually tackle a project like this. I make a line drawing trying to keep it as simple as possible. Just basic lines and shadows. All sections are numbered. Then I flip it over and trace again to get the pieces reversed. I then use this to trace all the pieces on fusible web. Anything that is large with no sharp cornered I do on freezer paper for less glue bulk but in this case the face #5 is the only one. On the bigger pieces cut out the inside for less glue bulk and remember to label each piece and put an arrow so you know which way is up. You can buy appliqué pressing sheets but good old kitchen parchment paper works just as good. 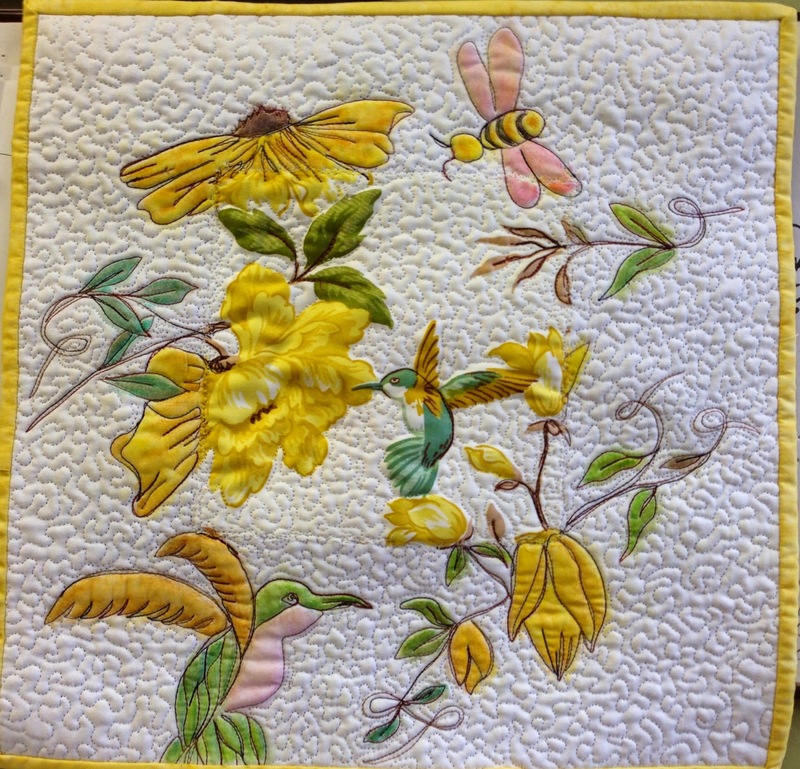 You can build your piece on it and the glue will not stick to the paper, just on the fabric that you place under it. Put the parchment paper over the right side pattern and you can see thru it to see where to put your pieces.minlike to build in chunks. Here is an ear with a eye. The ears were made then the top goes on. Keep your inspiration photo close by especially when choosing fabrics. And we have a sheep! Ready to pick out a background then will be shaded or painted, not sure what and of course quilted. I can pick her up and move her around now. Hopefully next week she will be done and I will tell you her story and where I found the photo of this adorable sheep. I'm linking up with Nina's off the wall blog.